Infinite Art Tournament: The Great Movies: "The Grand Illusion"
Leftists in Europe in the early 20th Century widely expected that when war broke out, the working class soldiers of the various national armies would ignore the orders of their officers, rising up together to overthrow the old order and institute a socialist paradise. A pipe dream? Sure. But it is also well known that soldiers in World War I frequently cooperated to minimize the number of casualties on both sides, and occasionally had to be disciplined back into a proper killing spirit after pernicious outbreaks of peace and international brotherhood. The idea that class unity trumps national unity when left to its own devices is what Renoir is getting at in The Grand Illusion. In this odd and episodic film, which is -- believe it or not -- basically a screwball comedy about the WWI Prisoner of War experience, upper-class officers fraternize with their social peers on the other side while casting dismissive asides about the worthless enlisted men and commoners. Among the working and merchant classes, relationships between erstwhile combatants range from mock-belligerent to cordial, and late in the film we get a discrete but indisputable French/German love affair. Filmed in 1937, with war gathering again in Europe, the film can be read as a plea not to subject natural human connections to the unnatural severing of war a second time. It is hard to judge The Grand Illusion fairly from today's vantage point. It was an influential film, for one thing, and many of its scenes have been quoted and replicated in a hundred movies since. A sequence about an attempt to tunnel out of a POW camp, for instance, seems kind of cliched and tired now but was a fresh and presumably pretty exciting idea at the time. The greatest unkindness that was wrought on The Grand Illusion, really, is "Hogan's Heroes." Once you've seen the screwball comedy of that old sitcom's wacky Stalag 13, it is much harder to watch Renoir's infinitely more ambitious screwball comedy with an open mind. Or, in my case, without periodically launching noisily into the "Hogan's Heroes" march. Mrs.5000 is a very patient woman. Plot: Captured French officers conspire to break out of POW camps in order to rejoin the fight. This in itself is an act of almost delusional patriotism, as the camps are more comfortable and laid back than most hotels in peacetime. Hijinx don't ensue so much as abound; filmed a couple of decades before the birth of the TV sitcom, Grand Illusion proceeds through two hours of what are essentially short skits, most culminating in some sort of gag. Visuals: Did you know that Renoir, the famous director, was the son of Renoir, the famous painter? Neither did I! 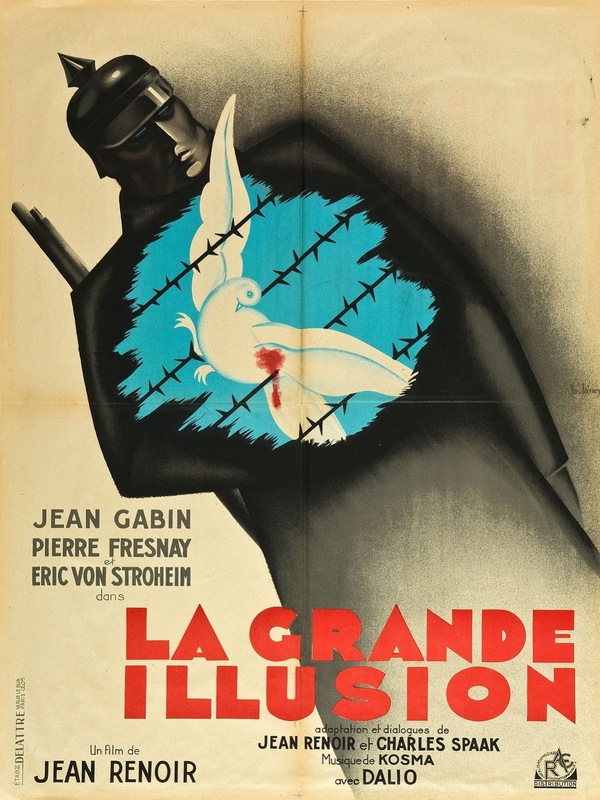 They were a visual family, and Grand Illusion is certainly a good-looking and well-framed moving picture. In several scenes, moving objects in the foreground pass off the screen, revealing interesting things behind them. It's a neat visual trick. Dialogue: In French, German, and occasional English, with subtitles. The dialogue seems carefully crafted to reveal the class identities of the various characters. Prognosis: Quite watchable, but only of particular interest to those with an enthusiasm for films of the era or genre. Hey, I just saw this movie a couple of days ago! I had much the same reaction you did. Ahead of its time in a lot of ways, this film.